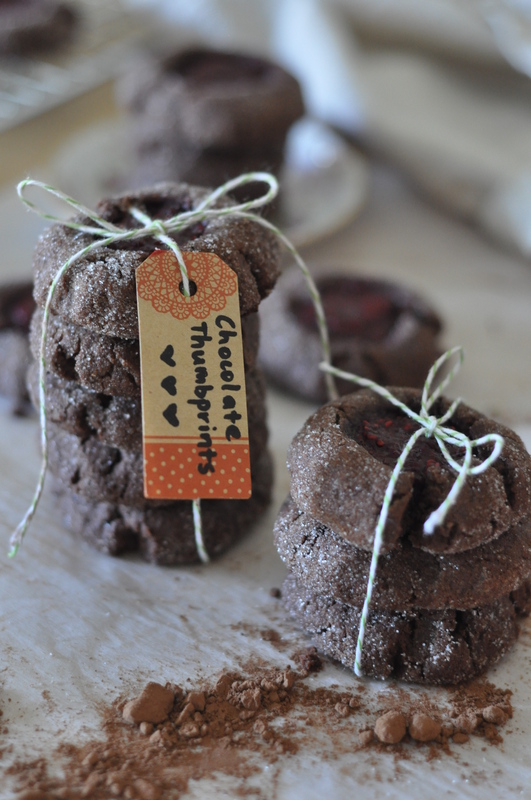 If you’re looking for something to spice up your cookie routine, then thumbprint cookies are the way to go. Don’t get me wrong, I love chocolate chip and oatmeal raisin cookies, but sometimes you need a little variety in your life. 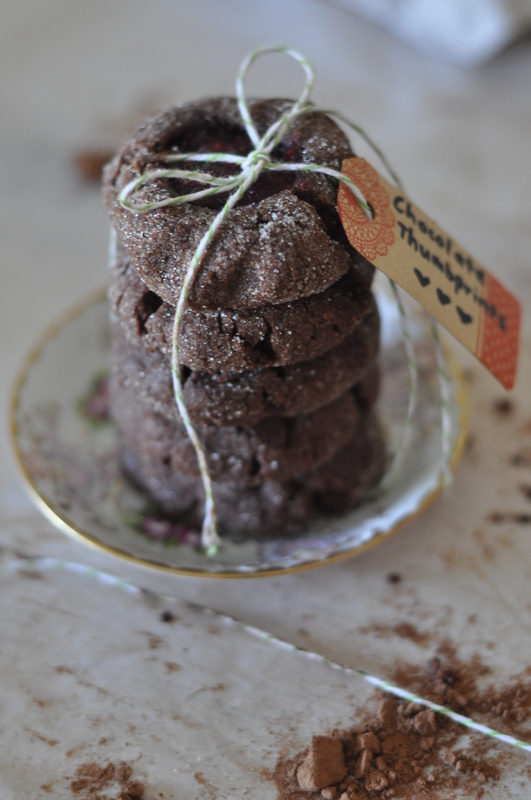 Thumbprints are buttery, soft and always filled with something in the center, whether it be with ganache or jam. And as the name suggests, one of the essential tools in making these cookies is your thumb. 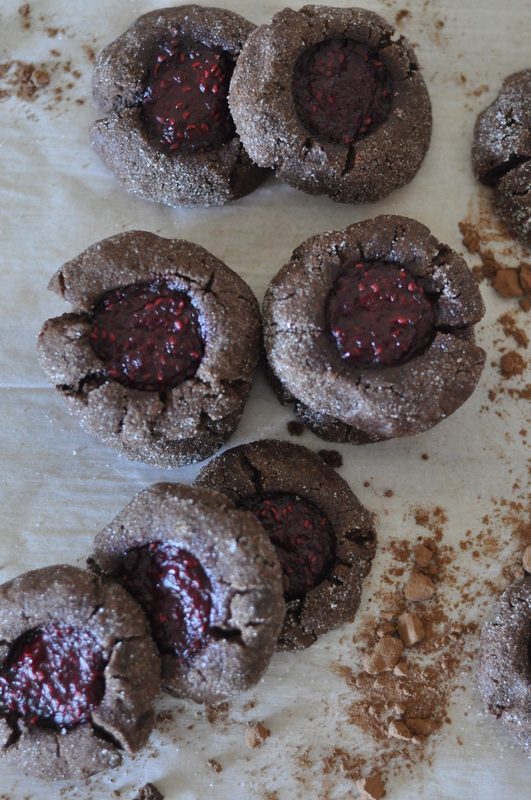 Since I had leftover raspberry compote left from my cheesecake recipe and the idea of throwing out the raspberry compote just did not sit well with me (see previous post about how I hate throwing out ingredients), I decided to make chocolate thumbprints from Martha Stewart’s recipe. I’m particular when it comes to getting all the cookies all the same size, so I weighed the dough to 1-oz pieces before rolling them into semi-perfect balls. Alternatively, you can use a cookie scooper. Then, using my thumb, I carefully ‘punched’ the center of each ball to create a well, in which it was filled with the raspberry compote. You can also keep the rolled and pressed cookies in the refrigerator if you don’t plan to bake all of them at once, but I don’t see why you wouldn’t…they’re delicious! Rolled, pressed, sugared and filled before going into the oven. 1. In a mixer bowl, cream butter and sugar together. Scrape sides of bowl as needed. 2. Add yolks, heavy cream, vanilla extract. 3. Sift together AP flour, cocoa powder and salt. 4. Add dry ingredients to the butter-sugar mixture in 3 additions, slightly mixing after each addition. 5. Mix until dough comes together. 6. Weigh 1-oz pieces and roll into balls. 7. Roll each ball into a bowl of sugar. Place onto a parchment-lined cookie sheet. Use your thumb to press down into the center of each ball. 8. Bake at 350F 12 minutes, rotating halfway through. 9. 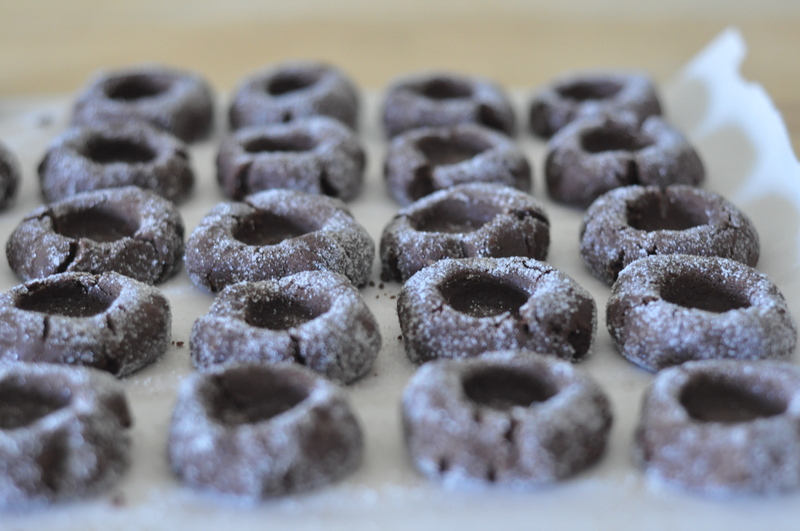 Allow cookies to cool completely before filling with desired filling. 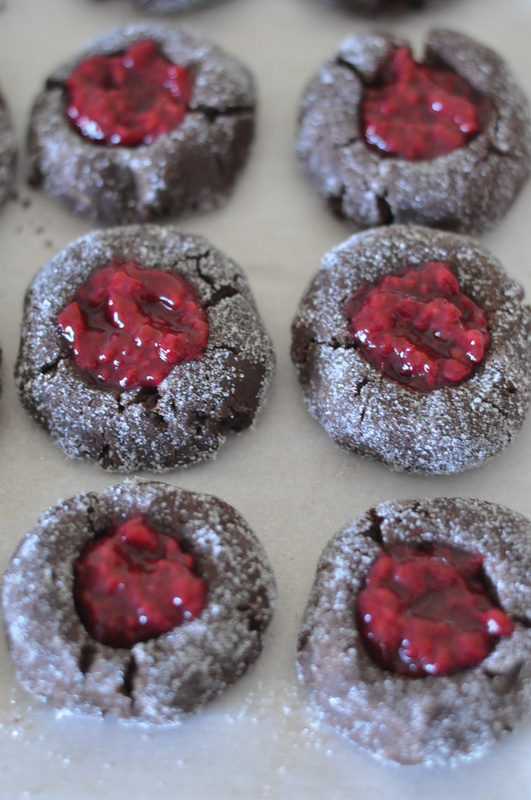 i’ve made jam filled thumbprint cookies several times in the past, but i filled them prior to baking. i’ll have to try the ganache idea!